A Syngenta temporary field employee delivers supplies to a local resident in the community of Las Mareas in Salinas, Puerto Rico. In the days leading up to the unwelcome arrival of Hurricane Maria in Puerto Rico, Liliana Sánchez Cortés, a Syngenta site manager, channelled her focus on the safety and well-being of her 45 Puerto Rico-based colleagues—and the maturing soybeans in the ground at the Syngenta research farm in Salinas. As her husband boarded up the windows of the home they share in Ponce with their two young daughters, Cortés and her team spent the weekend prior to the Category 4 hurricane harvesting soybean trials. The sheer determination with which Cortés and her colleagues approached the prehurricane harvest conveys the significance of seeds research and development (R&D) activities conducted in Puerto Rico. For 35 years, this island territory has been a critical link in the life cycle of biotech crops. Much of the hybrid seed planted throughout the world has, at some permutation during its development, been planted and harvested in Puerto Rico’s continuous nurseries. The three Syngenta research farms in Puerto Rico are integral to bringing new corn hybrids and soybean varieties to growers throughout the Midwest. “Puerto Rico is, in many cases, the first and most important location for the development of new crops,” Cortés says. So when Hurricane Maria pummelled the island in September 2017—a critical time between growing seasons—the stakes were high. The R&D seed program at @SyngentaUS weathers the storm in Puerto Rico. Thanks to a climate that can accommodate 52 weeks of planting and harvesting each year, Puerto Rico is an ideal environment for seeds R&D protocols. In fact, more than 85 percent of the commercial biotech seeds throughout the world pass through Puerto Rico, says Beatriz Carrión, executive director of the Puerto Rico Agricultural Biotechnology Industry Association (PRABIA). Conducting seed R&D activities in Puerto Rico yields a more efficient plant breeding program, with a significantly expedited development timeline. There, researchers can use data from crops harvested in the fall to develop new hybrid and variety combinations that may be planted as early as the following spring. 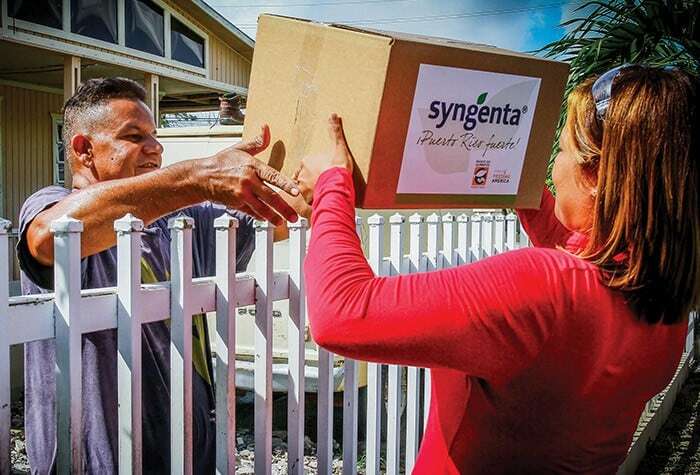 The three research farms Syngenta operates in Puerto Rico—one in Salinas and two in Juana Díaz—support the robust Syngenta global breeding program for various crops, primarily corn and soybeans. Just as Puerto Rico is integral to the productivity of the seed industry, the industry is an important contributor to the economic success of Puerto Rico. A PRABIA-commissioned economic impact study released in March 2018 reported that the ag biotech industry’s operations in Puerto Rico represent more than $65 million in net benefits for the local economy. And, as Carrión notes, that’s a conservative number. “When you consider the inter-industry multiplier effect, we’re looking at a true benefit of nearly $135 million,” she says. Seed Program in Puerto Rico: A Food Bank of Puerto Rico volunteer packs cans of food in supply boxes that will help Puerto Ricans in need following Hurricane Maria in 2017. Seed Program in Puerto Rico: A group of Syngenta and Food Bank of Puerto Rico volunteers in San Juan, Puerto Rico, take a break from packing supplies for local hurricane victims. Seed Program in Puerto Rico: Two volunteers load supply boxes onto trucks for delivery to residents in Salinas, Puerto Rico. Seed Program in Puerto Rico: Boxes of food supplies from Syngenta are ready to be delivered to a beach area in Salinas, Puerto Rico. Seed Program in Puerto Rico: From left to right: Ivonne Bernard with the Food Bank of Puerto Rico, a seasonal Syngenta employee and Liliana Sánchez Cortés with Syngenta hand deliver supplies to a local resident in Las Mareas in Salinas. Seed Program in Puerto Rico: Mayor of Salinas Karilyn Bonilla (far right) and her secretary (second from right) welcome Cortés (far left) and Bernard (second from left) when they arrive in Las Mareas, Salinas, to help local residents. Seed Program in Puerto Rico: Maria “Mayita” Melendez, mayor of Ponce, Puerto Rico, speaks with the media during post-hurricane relief efforts in Puerto Rico. Weeks prior to Hurricane Maria, the island braced for Hurricane Irma, which aside from widespread power outages, left Puerto Rico relatively unscathed. Hurricane Maria, however, would prove different. “It quickly went from ‘thoughts and prayers’ to actively preparing for a disaster,” says David Flakne, senior director of state affairs at Syngenta, who monitored the storm’s progress stateside. When the National Weather Service issued its first official hurricane watch on Monday, Sept. 18, Cortés immediately activated the company’s emergency plan, dismissed employees and made one final trip to the grocery store—which entailed a three-hour wait in the checkout line, before going home to hunker down. The hurricane reached landfall two days later. What happened next dominated the news globally, accompanied by images of buildings blown apart, landscapes stripped of vegetation and downed power lines. The Syngenta facilities, which had benefited from a $6 million building investment project, completed in early 2017, experienced flooding. Structural damage also resulted in some destroyed plant genetic material. But in the midst of the devastation in surrounding communities on the southern part of the Island, Cortés counted her blessings. More difficult to count were employees in the days following the event. Hampered by a debilitated communication infrastructure, it took nearly two weeks to account for Puerto Rico-based Syngenta employees, three of whom had lost their homes. Meanwhile, in Wisconsin, Flakne embarked on the assignment of a lifetime: helping lead relief efforts. Empowered by the Syngenta management team and supported by a logistical dream team of Syngenta employees, representing a diverse cross-section of departments and functions, Flakne and the stateside team led efforts and organized two airlifts of emergency supplies to Puerto Rico in the weeks following the hurricane. The first airlift, a joint effort with another agribusiness, delivered generators for the Syngenta facilities and all full-time Syngenta employees on the island, as well as satellite phones to help alleviate the communication issues. The second airlift was a 747 cargo jet charter containing 220,000 pounds of food, water and household goods, including 80,000 pounds of baby food and V8 juices from The Campbell Soup Company, which donated to the Syngenta airlift without hesitation, Flakne says. Within mere weeks of the hurricane, Syngenta was up and running, with new seedlings in the ground by mid-October. While operations weren’t back to normal—that would take many months—the team was able to get its work done and navigate lingering challenges, including the scarcity of seasonal workers who had previously supported operations at key times throughout the year. Many of these seasonal workers had joined the post-hurricane exodus to the mainland and were no longer available. For Cortés, that has meant casting a wider net to bring in the nearly 500 seasonal workers needed. Increased training has been imperative to bring workers with little-to-no ag experience up to speed. For Flakne, the relief efforts brought to light the true character of Syngenta. 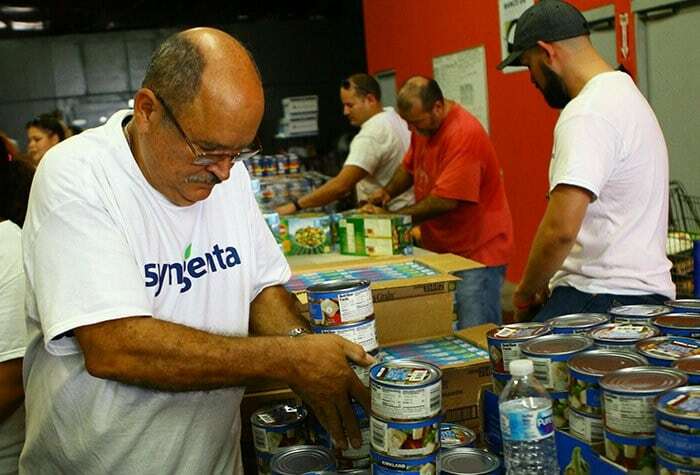 In addition to organizing the charters, Syngenta contributed $200,000 to the Food Bank of Puerto Rico, which helped organize a series of food drives in which Syngenta employees, the local mayors and other community leaders participated. These desperately needed supplies were distributed in the communities near Syngenta facilities on the south side of the island throughout the remainder of 2017.